Rebecca Hall, the daughter of British film director, Peter Hall and his opera singer wife, Maria Erwig, has proven over the years just how much she is a chip off the old block. Hall earned her first major break with Christopher Nolan’s 2006 thriller film, The Prestige. Her other notable works include; Vicky Cristina Barcelona, Frost/Nixon (2008), The Town (2010), The Awakening (2011), Iron Man 3 (2013), and a host of others. Hall has a handful of accolades to celebrate her success in the entertainment industry. We take you through her illustrious career as well as reveal interesting facts about her personal life. Rebecca Maria Hall was born on the 3rd of May 1982 in London. She was born to the renowned film director, Peter Hall who founded the prestigious, Royal Shakespeare Company. Peter Hall passed away in September 2017 aged 86. Hall’s mother, opera singer Maria Ewing is of a mixed heritage including Sioux, African-American, Scottish, and Dutch. Hall’s parents divorced when she was still a kid but would both remain active in her life. She has about 5 siblings including step-siblings from her parent’s other marriages. All of Hall’s siblings are either directly or indirectly involved in the entertainment industry. Her paternal half-brothers; Edward and Christopher are both filmmakers while her maternal half-sister Jennifer Caron Hall is an actress. Her other sibling Emma Hall is also an actress while Lucy is a stage designer. Growing up around all things show business, Rebecca Hall knew very early in life that all she wanted to become was an actress. At the age of 10, she appeared in the 1992 television adaptation of The Camomile Lawn which was directed by her father. She would go on to act in a couple of other TV shows. Hall attended Roedean School, where she was the head girl. She then attended St Catharine’s College, Cambridge where she studied English Literature. She dropped out in 2002, a year before graduation to begin her professional acting career. Rebecca Hall made her professional stage debut in Mrs. Warren’s Profession, a 2002 play that was directed by her father. In 2006, Rebecca Hall made her feature film debut in Starter for 10 and earned her big break the same year with Prestige. Hall has since remained active in stage, TV, and film. However, she tends to be more focused on feature films. Husband or Boyfriend, Is She Married? 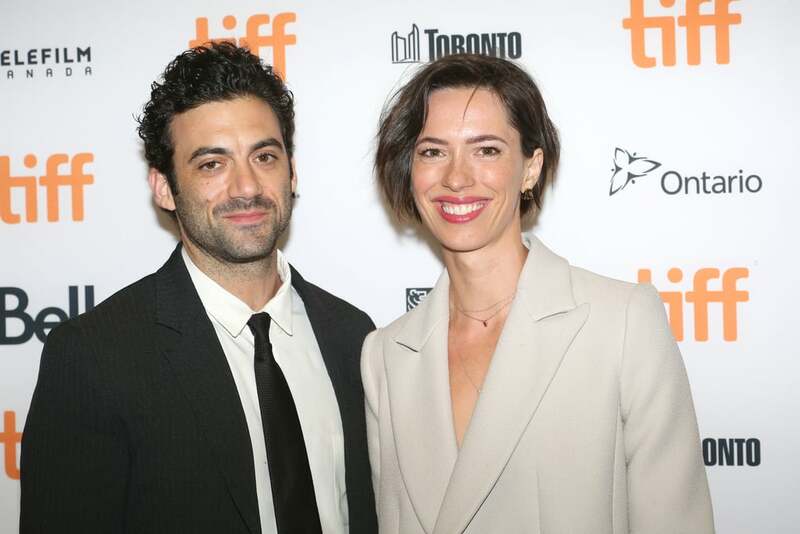 Rebecca Hall is married to fellow actor, Morgan Spector, who is American. The couple first met on set while acting together in a 2014 Broadway production of the play Machinal. They were very private about their romance which proved to have been a pacey one as they got married in 2015 just a year after being together. Hall was a year into her break up from Skyfall director Sam Mendes before meeting Spector. Their relationship began in 2011 after Mendes’ marriage with Kate Winslet ended in a divorce. They had met in 2006 on the set of Hall’s debut film, Starter for 10 as executively produced by Mendes. Hall and Mendes lasted together for two years before calling it quits in 2013. Though Hall and Spector kept their relationship very private, they were spotted out in public for the first time holding hands in New York City in July 2015. A couple of months later, the pair tied the knot in a private ceremony held in Saugerties, New York. Attendants of the wedding included David Blaine who entertained guest with magical tricks. Morgan Spector who was born on the 4th of October 1980 in Santa Rosa, Northern California, began acting in plays from the early age of 8. He continued acting in many school productions and after graduating from Reed College, in Portland, Oregon, he proceeded to further hone his acting skills at the American Conservatory Theater, in San Francisco. He relocated to New York City in 2006 and in 2010, made his Broadway debut portraying Rodolpho in Gregory Mosher’s revival of A View from the Bridge, a play written by Arthur Miller. Hall’s husband made his screen debut in a small role in Raspberry Heaven and from 2009, he became more frequent in screen gigs. His film credits include; The Last Airbender, The Drop, and Chuck. He has appeared in TV shows such as Person of Interest, Orange Is the New Black, Allegiance, The Mist, and Homeland. • In 2010, Rebecca Hall received a BAFTA Award for Best Supporting Actress; this was for her role in Red Riding: In the Year of Our Lord 1974. • Her first ever award was a Gotham Award which she won as part of the Ensemble Cast of Vicky Cristina Barcelona (2008). • Hall won two awards for each of her films; Please Give (2010) and Christine (2016). • During her college years, she established her own theatre company. • Rebecca Hall grew tall very fast. She has been standing at 5 feet 10 inches since she was 11 years old. • Hall appeared in the James Blake music video of his song, “A Case of You”.